vCenter 6.5 U1x is not supported to manage 6.5 U2 host. It can work but you definitely run into issues over time. Thought so as well, but this is incorrect. You can manage the ESXi with any VC as long as the major+minor versions are same. So any 6.0 VC can manage any 6.0 host, any 6.5 VC can manage any 6.5 (and some lower) hosts. Regular Backup is still also working but we didn't have any issued before either. I'm now looking into updating to vSphere 6.7. Just to clarify where we are, is it correct to say that Veeam currently does not support/recommend moving to 6.5 u2 on either esxi or vcenter? We've had some internal questions on if we can update vcenter at this time and wait for esxi support. Thanks!! Correct, 6.5 U2 is not currently supported due to a major regression in ESXi code that makes vSphere API start failing under heavy host load. Is 6.7 currently fully supported or should we expect backup issues under heavy load with vSphere 6.7 as well? 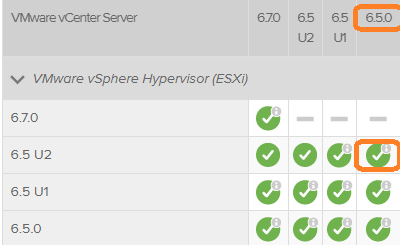 vSphere 6.7 is fully supported with Update 3a, no issues under heavy load there. I have an open ticket on 6.5 u2 as well. If the 9.5 update 3a is available, even if it is not perfect for 6.5u2 (can we at least access this update to see if this helps resolve some of the issues. nobrell wrote: I'm now looking into updating to vSphere 6.7. Nobrell, I just saw today that upgrading from 6.5U2 to 6.7 is currently not supported (https://my.vmware.com/web/vmware/detail ... rPId=23762). I thought you'd think it's quite relevant if you hadn't seen it before. I'm sure that they'd figure out an upgrade path to 6.7 at some point, but something to keep an eye on. RayEL wrote: I have an open ticket on 6.5 u2 as well. If the 9.5 update 3a is available, even if it is not perfect for 6.5u2 (can we at least access this update to see if this helps resolve some of the issues). Yes, most certainly. Your support engineer will be able to provide you Update 3a bits. Currently no ETA as the heavy load issue is still there. The release date for the 6.5U2 support is basically "never". Veeam will only be able to fully support 6.5U2 deployments starting from some newer buld (like 6.5U2a or something, as VMware usually names them). Basically, whatever ESXi build will bring a fix to the issue, we will be able to immediately support with Update 3a (unless it breaks something else). Gostev wrote: Veeam will only be able to fully support 6.5U2 deployments starting from some newer buld (like 6.5U2a or something, as VMware usually names them). A new build seems to be available! It's a patch that addresses the specific issue, which is clearly not the one in question.